Shee was an Irish writer and painter whose first contact with royalty was a commission in 1800 to paint the Duke of Clarence (later William IV). 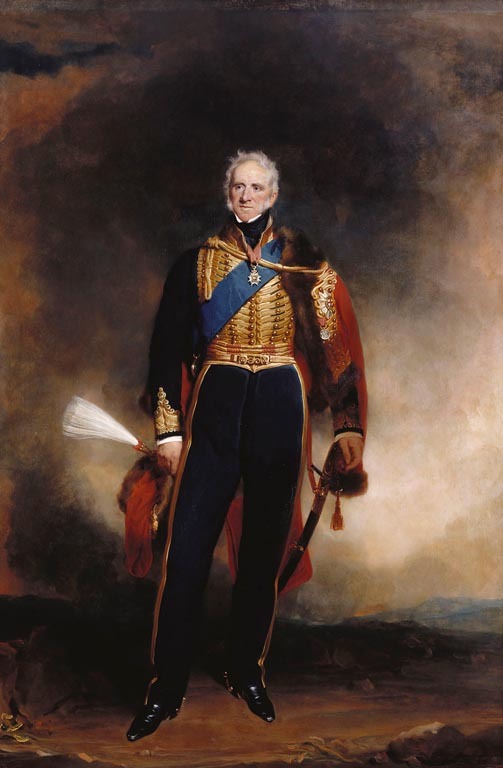 His moment came in 1830 when William IV succeeded his brother and when he succeeded Lawrence as President of the Royal Academy and was knighted in the same year. All the original works of Shee in the collection were commissioned or acquired by William IV. Shee did also paint Queen Victoria in 1842 (Royal Academy). This portrait was one of two commissioned by William IV (OM 1086-7, 401453 and 405141) and exhibited at the Royal Academy in 1836, where it was stated explicitly that they were intended for the Waterloo Chamber. Both sitters were British heroes of that battle, and reflect the move at this time to make the Chamber live up to its name, rather than being (as originally intended) more about the international diplomatic activity following the defeat of Napoleon. This image does not reveal that the sitter lost a leg at the Battle of Waterloo; the renouned soldier is shown wearing dark blue uniform of a General Hussars with much gold braiding, a red pelisse over left shoulder. He bears the riband of the Order of the Garter and ribbon and badge of the Order of the Bath and holds his plumed hat in his right hand. A battle is raging in the background, creating, as so often in portraiture of this type, a private storm cloud surrounding the sitter's head.